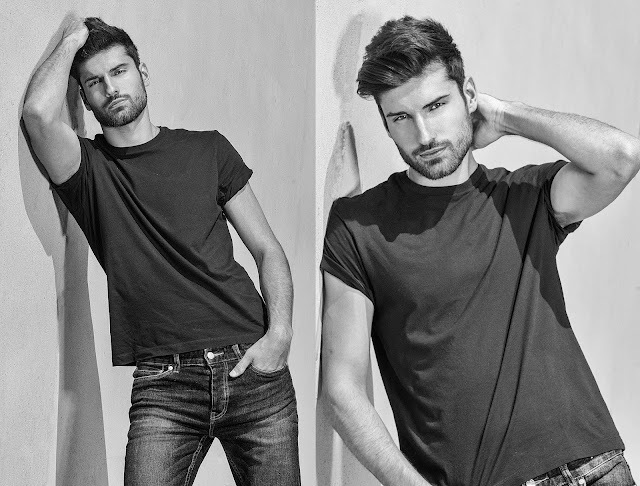 A couple of weeks ago I had a great time test shooting model Alex Powell, one of the new faces of Elite Model Toronto. He was such a trooper because it was raining when we did this photos shoot at the park near my place. While in the middle of the photo shoot, a thunder storm suddenly came. For a moment there, I was afraid that we might get hit by a lightning or get electrocuted from the power pack. So needless to say we packed all the equipment and ran inside. We got all wet and muddy. But I never heard a single complain from him. In fact, he thought it was funny. Then we just continued shooting at my new place, after a pizza break, which by the way Pizza Pizza had delivered burnt. We were hungry so we just ate it. Alex came from Newfoundland and just recently moved here in Toronto. He is a very sweet guy and has very endearing small town charm. I was so jealous of his amazing abs so I asked him how get those. He told me he runs all day. Well, I guess I better start running every day now too. With his great personality that equally matches his gorgeous looks, there is no doubt he will be successful.